In a fight-to-the-finish between undefeated teams, the 2014 USA Basketball Women’s U17 World Championship Team (7-0) came out victorious with a 77-75 win over Spain (6-1) in the gold medal game of the 2014 FIBA U17 World Championship on Sunday night at City Arena in Pilsen, Czech Republic. This is the third gold medal for the USA in as many championships since the inaugural event in 2010, and the USA now boasts of a 23-0 overall U17 record. Three players in double-figure scoring helped the USA overcome a 40-point performance from Spain’s Angela Salvadores, who was named tournament MVP. Joining her on the five-member all-tournament team were the USA’s Joyner Holmes (Cedar Hill H.S./Cedar Hill, Texas) and Katie Lou Samuelson (Mater Dei H.S./ Huntington Beach, Calif.), as well as Hungary’s Debora Dubei and Virag Kiss. Earlier today Hungary (6-1) fought off host Czech Republic (4-3) 67-61 to earn the bronze medal. Lauren Cox (Flower Mound H.S./Flower Mound, Texas) led the USA past Spain with 20 points, including 4-of-4 from the free-throw line, 12 rebounds and a USA Women’s U17 single-game record eight blocked shots; Asia Durr (St. Pius X Catholic H.S./Douglasville, Ga.) scored 17 points to go with four assists; and Arike Ogunbowale (Divine Savior Holy Angels H.S./ Milwaukee, Wis.) added 15 points and eight rebounds. With the game tied at 71-all and 1:36 remaining in the fourth quarter, Cox scored at 1:28 and then blocked Spain’s next shot attempt and recovered the rebound, and then Durr pulled up in the key to score from the field to make it 75-71. Spain made a 3-point attempt that was whistled off because of an offensive foul, and the USA got the ball back, but missed its next shot attempt. Salvadores scored a driving layup at 10.8, but as Spain was forced to foul, Durr hit two free throws, and the USA led 77-73 with 7.1 seconds. The game reached its 77-75 final when Salvadores scored her final two points at the buzzer. The match began with the USA taking a 7-2 lead when Samuelson made two free-throws at 8:02, but Spain fought back to trail 9-6 at 4:28. From there, the teams traded scores for the next few minutes before Spain compiled a 6-0 run to take a 16-15 lead at 44.6 seconds. 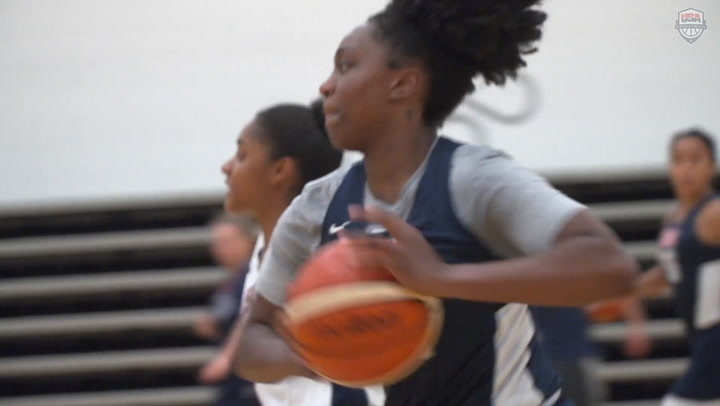 Ogunbowale drove into the lane for two points at 27.9 seconds to end the first quarter with the USA leading 17-16. After Salvadores started the second period with a score at 8:42, the USA put together its own 6-0 run to lead 23-18 when Cox scored on a fast-break assist from Durr at 7:24, forcing a Spanish timeout. With two 3-pointers from Iris Junio, Spain tied the game at 25-25 at 5:00, but the USA closed the first half by outscoring Spain 11-6 to lead 36-31 at halftime. 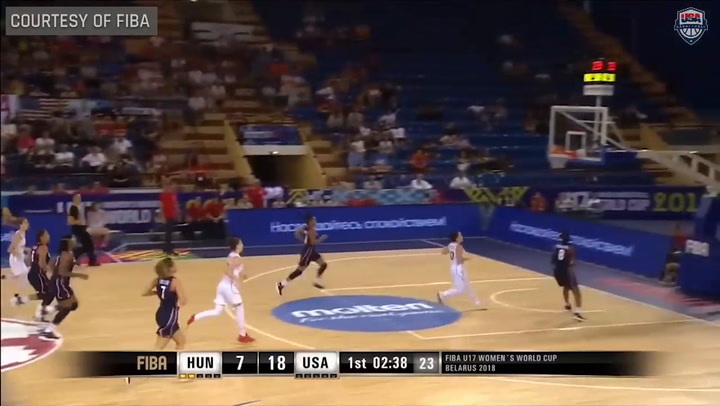 With six straight points to start the second half, the USA built its largest lead of the game, 42-31 when Durr scored on a fast break that resulted from one of Cox’s eight blocks in the game. While the USA never quite let Spain break free, it did allow six 3-pointers that helped Spain put up 25 points to the USA’s 16, and the U.S. led was just two points, 58-56, headed into the final 10 minutes. Spain opened the fourth quarter with two more three pointers, while Cox made two free throws, and Spain led 62-60 at 8:40. The lead changed hands three more times before the USA tied it up at 71-all and was able to close out the game in the final few minutes. The USA also set several individual and team USA Women’s U17 records, including new team competition records for 3-point makes (5.9) and attempts (17.6) per game and highest free-throw percentage (.739). Individually, Samuelson set competition records for 3-point makes (2.7) and attempts (6.7) per game; Kristine Anigwe (Desert Vista H.S./Phoenix, Ariz.) set records for free throws made (3.5) and attemped (5.1) per game; Durr set a record for free-throw percentage (.882); and Cox set records for rebounds per game (8.4) and blocks per game (2.7). For the tournament, four U.S. players averaged double-digit scoring, including 13.9 points per game from Samuelson, 13.4 ppg. from Durr, 10.7 ppg. from Ogunbowale and 10.6 ppg. from Holmes, and all 12 players averaged at least 9.0 minutes per game of playing time. “To think that we’ve only been together a couple weeks, and that’s what these young ladies have put together, to play this kind of basketball is truly amazing and a testament to their talent,” Phillips said of the team. 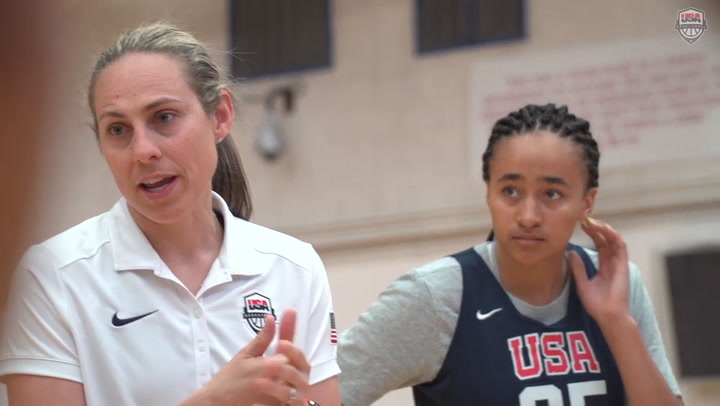 The USA’s assistant coaches are Mary Coyle Klinger (Rutgers Preparatory School, N.J.) and Brian Robinson (Bishop McGuinness H.S./Stealers AAU, N.C.). Earlier today, Australia (6-1) won against Canada (3-4) 69-39 to finish 5th and 6th, and Japan (4-3) edged France (3-4) 65-60 for 7th and 8th place, respectively. In the 9-16th playoffs in Klatovy, Czech Republic, Slovakia (2-5) captured 15th place with a 63-55 win over 16th-place Egypt (0-7); Italy (3-4) earned 13th place after beating 14th-place finisher Mexico (1-6) 64-52; 11th and 12th places went to China (3-4) and Mali (1-6), respectively after China downed Mali 61-27; and in the 9th-10th-place game Brazil (5-2) recorded a 68-63 win over South Korea (2-5). 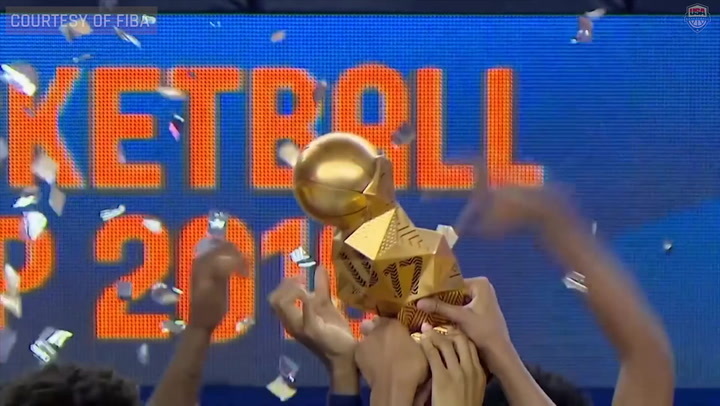 2010 marked the inaugural FIBA U17 World Championship for Women, which is held every two years, and the 2010 and 2012 tournaments featured eight games, as opposed to the seven games played in 2014. USA Basketball's U17 National Team captured the 2010 FIBA U17 World Championship gold medal after beating opponents by a 37.4 ppg. scoring margin and seven of the USA's 12-member team went on to capture the 2011 FIBA U19 World Championship gold medal. The 2012 USA U17 World Championship Team averaged a 35.0 points per game margin of victory in extending the USA's winning record to 16-0 at the event and collecting its second gold medal. The USA qualified for the 2014 FIBA U17 World Championship by virtue of advancing to the medal semifinals of the 2013 FIBA Americas U16 Championship. Based in Colorado Springs, Colorado, USA Basketball, chaired by Jerry Colangelo, is a nonprofit organization and the national governing body for men's and women's basketball in the United States. 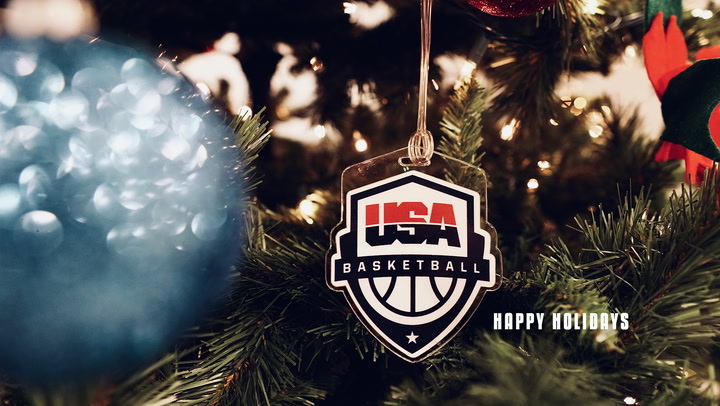 As the recognized governing body for basketball in the U.S. by the International Basketball Federation (FIBA) and the United States Olympic Committee (USOC), USA Basketball is responsible for the selection, training and fielding of USA teams that compete in FIBA-sponsored international competitions, as well as for some national competitions, and for the development of youth basketball initiatives that address player development, coach education and safety.